Day 10 was a shopping day. Spent most of the day wandering around Shinsaibashi, Den Den and Namba. Did manage to find time for a nice lunch near Dotonburi and an evening meal in Namba though! Tomorrow is departure day. I’ll probably fit in a trip to Shi’tennoji temple in the morning and then some more shopping in Namba later but after that it’ll be a trip out to Kansai International Airport for the late night flight to Dubai followed by an early morning connection back to Glasgow. It’s been a great trip this one. I’ve visited some great new locations, redid a few old favourites in a different season and seen some old favourites from new viewpoints. 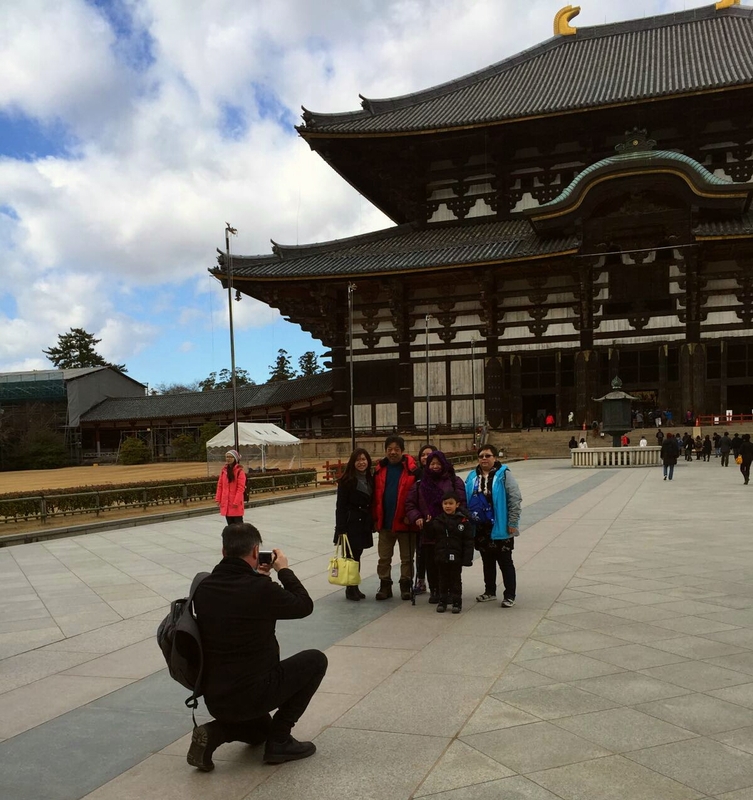 I particularly enjoyed Nara, Minoo Park, Koyasan and the Philosophers Walk this time around. Also, it was nice to finally visit Himeji Castle and to catch a glimpse of Kiyomizu-dera. Typically, the weather forecast for next week is for snow on three or four days so looks like I’ve missed out on some great photography conditions by just a week but I’m glad I’ve managed to visit and photograph what I have done this year. It may well mean I have to revisit in winter again in the hope of better light and more snow but I’ve really enjoyed seeing Japan in the winter and I’d definitely recommend it to anyone looking for a break in January / February as the facilities are mostly still fully open but the crowds that seem to be everywhere in summer and autumn just aren’t here at this time of year. My next trip will hopefully be in springtime to catch the Sakura season in full bloom. Who knows, perhaps I can have a longer visit next time and come back in late February and stay until the Sakura has blossomed in March? I hope so! I’ll get started editing the pics when I get home on Tuesday, so stay tuned to my Facebook and instagram pages to see them as soon as they’ve been posted. Day 9 began with a trip out to Kyoto and a change of train for the short journey to Fushimi-inari. I’ve visited this site every time ive been in Japan but today was different as for the first time I decided to go off the normal tourist track. 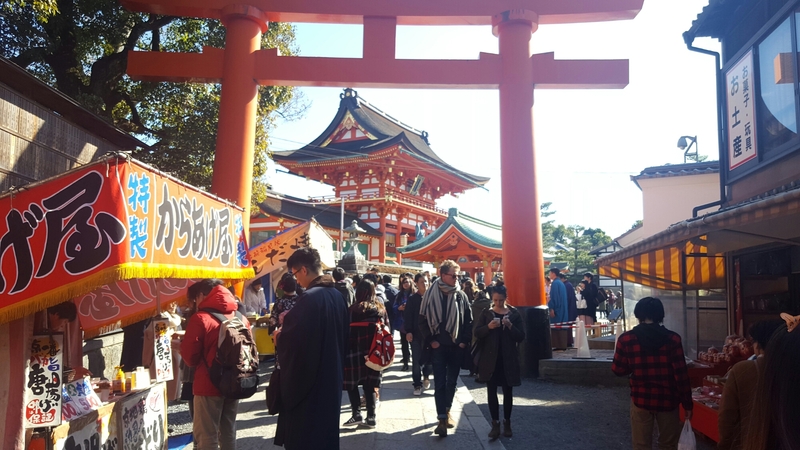 With last night being Mantoro, today was officially the first day of spring so this popular Shinto shrine was extremely busy, and getting off the main tourist path was essential for getting away from the crowds. After some street food on the way from the station (noodles with pickled ginger, bacon and dried fish – very nice!) 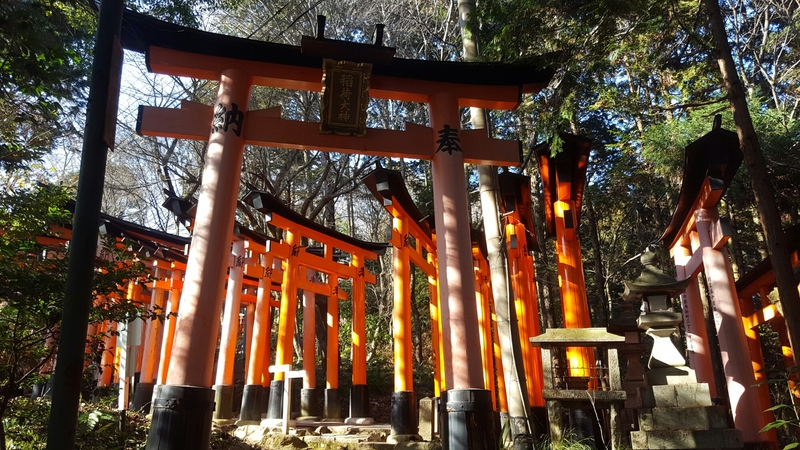 we headed in to grab the usual tourist snaps of the main Shrine and the path of torii gates before leaving the main route to explore the forest. Once off the main tourist path the forest is surprisingly quiet, with no more than 3 or 4 people on the path. 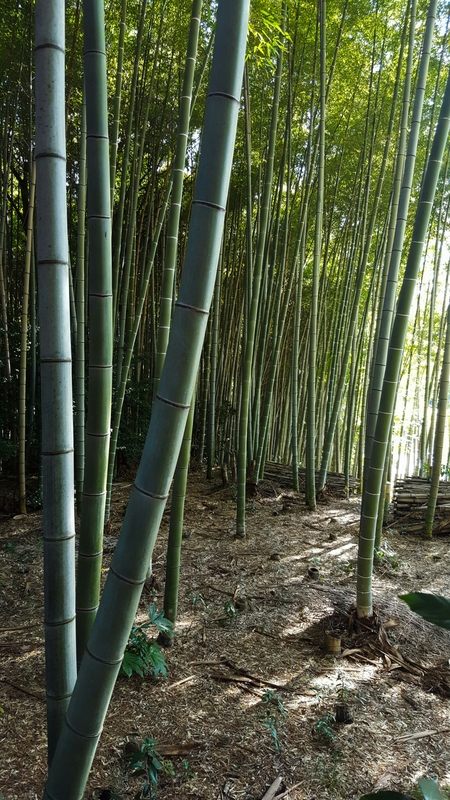 Our route took us past some small shrines and climbed gently around the base of Mount Inari through bamboo groves and a forest of evergreen trees with some fine views over Kyoto. 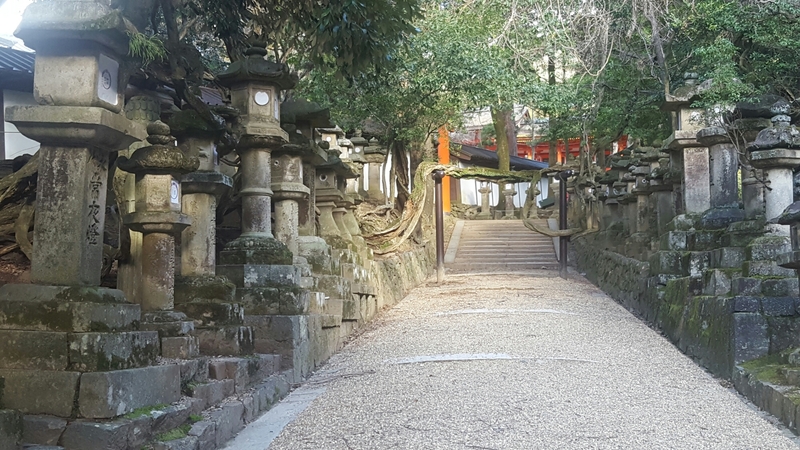 After a gentle 2km hike the path suddenly climbs steeply up the hill side in a series of zig zags which strike up through the forest to reach the summit of Mount Inari. 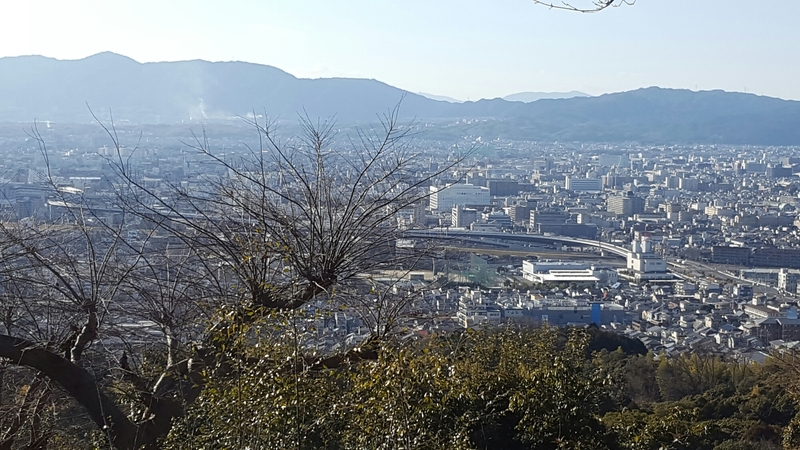 Although only a modest 233m (approx 755 ft) high, the steepness of the climb and the views oùt over Kyoto make the mountain feel much higher. After a break and cold beer it was back down the hill, this time following the much busier but less steep tourist route through the torii gates. Once at the bottom, and back in the busier than ever Shrine there was just time to grab a few more shots of the torii gates before heading off again towards the railway station to go visit another new location. The second location of the day was Kiyomizu-dera, a huge Buddhist temple complex in the hills to the east of Kyoto. A World Heritage site, which was included in the list of 20 finalists for the New 7 Wonders of the World project, this site is very popular with tourists. Unfortunately it closes at 6pm and with the hike at Fushimi-inari taking longer than expected there was not enough time to visit the main temple. 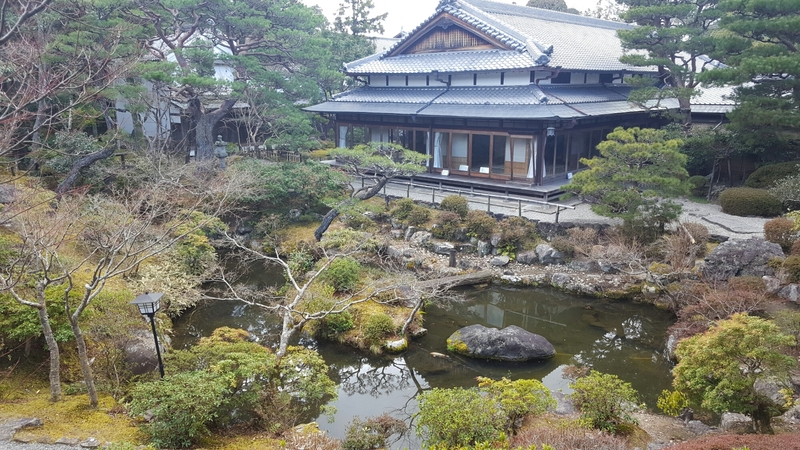 The main hall in the temple is built over the Otowa waterfall where three streams plunge into a pool. 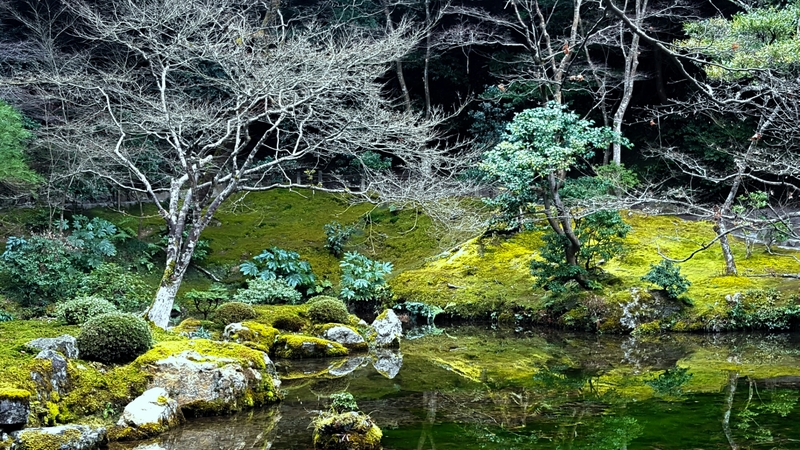 The water is said to be unusually clear (Kiyomizu actually means Pure Water) and visitors often catch the water as it falls to drink as it is said to give good health & grant wishes. 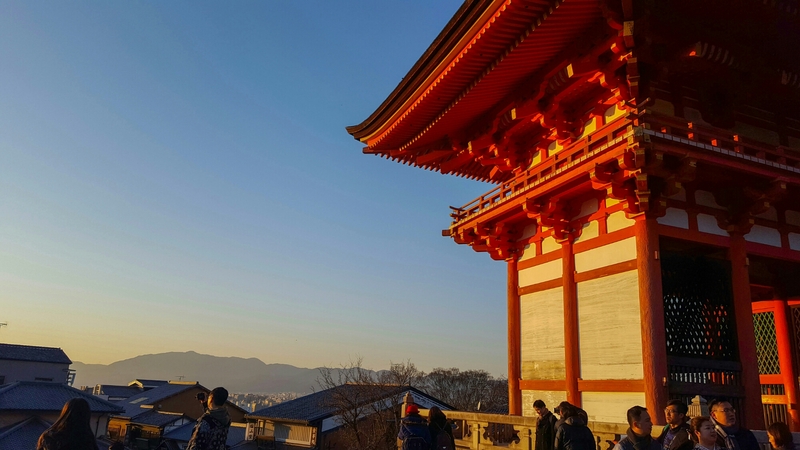 With time limited and the sun beginning to set, we spent some time at the Shinto shrines outside the main Buddhist complex snapping some shots with the bright orange Shinto shrines beautifully lit by the setting sun. The sunset tonight was beautiful and made a lovely ending to another day of new locations. It’s a pity there wasn’t more time to explore Kiyomizu-dera but I’ll definitely make a point of spending more time at this location next time I’m in Japan! Tomorrow is a day off from photography, a day of shopping for gifts and souvenirs so tonight was also a night off. A nice meal and drinks in Hommachi and Shinsaibashi was followed by a walk back to the apartment at 1am. Ever since this trip was booked there was one day I was looking forward to more than any of the others and it was today. 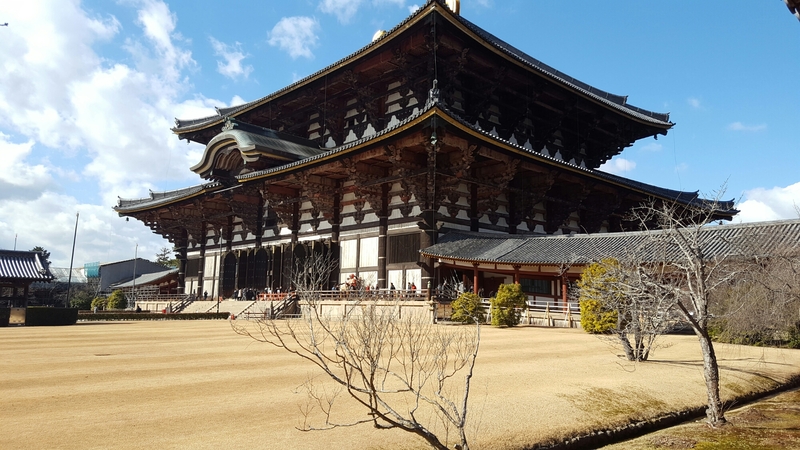 I’ve always enjoyed visiting Nara. I love the traditional gardens, the Buddhist Todai-ji temple and the Shinto Kasuga Taisha Shrine, but today was a special visit. February 3rd is Setsubun Mantoro, an 800 year old ceremony celebrated by Shinto and Buddhist temples across Japan to celebrate the end of winter and the beginning of spring. As I’m here to try to capture something of the Japanese culture of the four seasons this was always going to be a special day for me. I’m glad to say I wasn’t disappointed! The day began around noon with a walk to Namba station and the train to Kintetsu-Nara. After a lunch of tempura and rice it was a pleasant stroll to the Kofukuji Temple and its five story Pagoda which was already set-up for the celebrations later in the day. From Kofukuji, a short walk to the traditional gardens of Yoshikien allowed me to take some photos of this lovely garden in a new season. 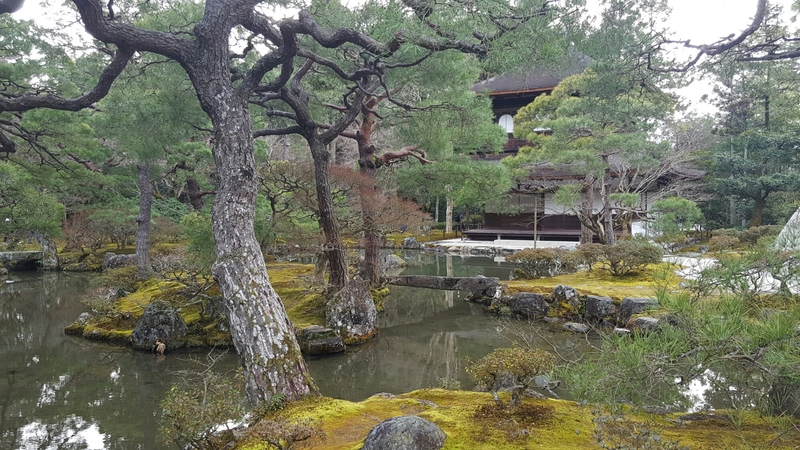 I’ve now managed to photograph the Water Garden, the Moss Garden and the Flower Garden of Yoshikien in summer, autumn and winter and I’m already looking forward to seeing this beautiful garden in spring. 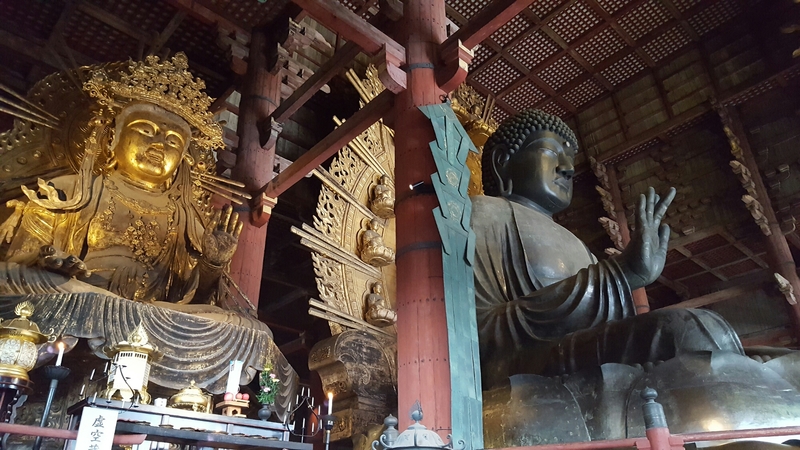 After Yoshikien it was another brief walk to Todai-ji Temple, once one of the Seven Great Powerful temples of Japan and home to the world’s largest bronze statue of the Buddha Daibutso. There is a lot of work being done on the exterior of the temple at the moment, probably as it’s a relatively quiet season for visitors, so there was only limited opportunities for photos of the temple from a distance but I managed to grab a few inside the temple using a lens I didn’t have on my previous visits so I’m looking forward to having a look at those images when I get home. On the way in a family of Chinese tourists asked me to take a group photo of them in front of the temple. The small boy in this image asked me and then later thanked me in perfect English, which made me slightly embarrassed that the limit of my Chinese is yes, no, thank you and my name is John! 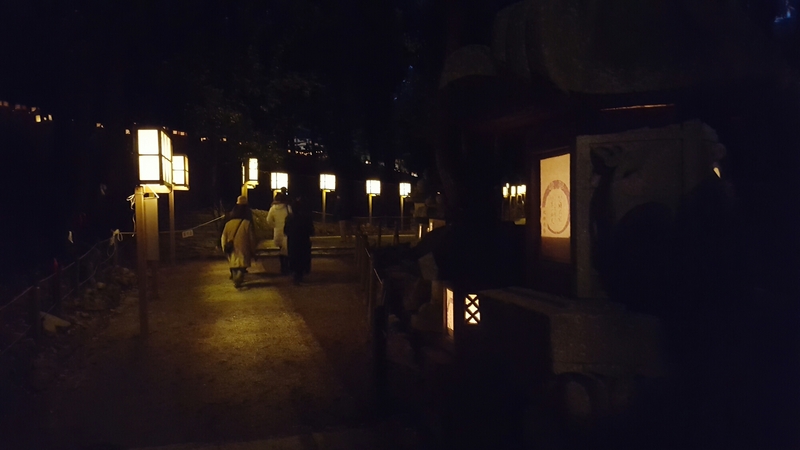 After a walk around Todai-ji it was a short walk to Kasuga Taisha Shrine for a relaxed wander around the forest before the festival began at 6pm, just after sunset. 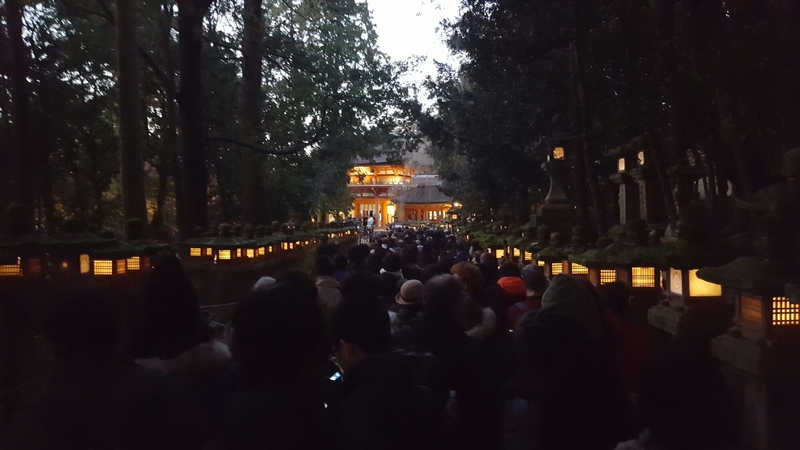 Around 5pm people began to gather around the main Shrine and as the sun set a Shinto ceremony began accompanied by drums and other traditional instruments. 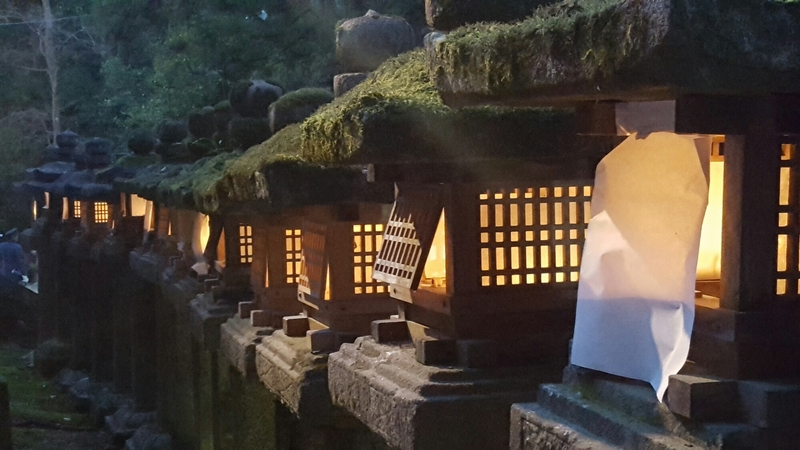 By this time all 3000 stone lanterns had been lit and the smell of incense filled the forest. The next hour or so was spent wandering around the forest photographing the lanterns and shrines. It was cold and dark and should have felt miserable but it was such a privilege to experience this ceremony that I never noticed the cold. The photos on this blog were taken with my phone and don’t really do justice to the atmosphere of the place tonight but I’ll post some from my camera when I get back. For the photographers out there, I shot the entire evening on an f1.8 lens so I’m hoping the final images will be quite atmospheric with a very shallow depth of field. Watch this space to find out! Tonight was great and on the walk back to Kintetsu-Nara for the train to Osaka I reflected on this whole project of recording Japan in all four seasons and the bigger goal of trying to link this in some way with my images of Scotlands four seasons. While it feels a bit too much to take on at times, I’m grateful that I’ve had the opportunity to visit this fascinating country so many times and I really hope that the final collection of images does this amazing country justice. 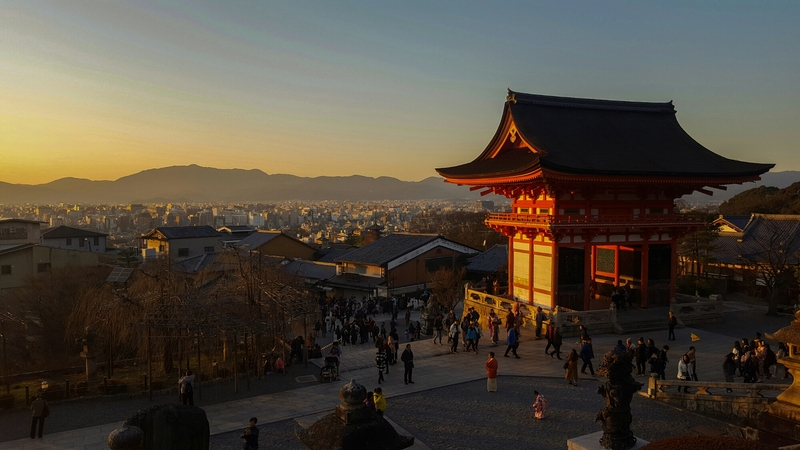 Tomorrow is a new location, Kiyomizu-dera in Kyoto followed by a repeat visit to Fushimi-inari… hope you can join me! A relatively late start today – didn’t leave the apartment until after 11am, then a short walk to the underground was followed by a journey to Umeda and a brief walk to the Hankyu line and the train to Kyoto. First time in Kyoto on this trip so I was looking forward to seeing if it’s different in winter. A rather convoluted journey from the Hankyu line in Kyoto involving a walk, two different underground trains and then another walk found us at the start of the philosophers path near Keage. I did this walk last time I was in Japan and it was surprisingly busy. One of the main attractions on the route is the cherry tree lined canal but with it being winter and no leaves or blossoms I wasn’t expecting the same visitor numbers. Fortunately the walk was much quieter so perfect for photography. Today though, there was never any more than 5 or 6 people in the whole garden so I managed a lot of nice new compositions which would have been impossible last visit. Again, I was amazed at just how few visitors there were at this time of year. I left the silver pavilion rather annoyed last time because it was almost impossible to get a single photograph but thankfully it was different this visit, albeit with less leaves, no flowers or blossoms, very little sun, and a LOT colder! After the silver pavilion it was time for the walk back to Keage then the two subways back to Kyoto before finally boarding another train to Kawaramachi and an early evening visit to Gion for some Meiko spotting amongst the old tea houses. I managed to snap a few Meiko – no Geisha – and at group of entertainers in traditional costume and makeup so watch out for those shots when I return! Finally it was time for a well earned break in Pontocho, Kyoto’s traditional entertainment district, famous for its restaurants, bars and night life. After a few beers and a great Japanese whisky (the Yamazaki 12 year old single malt) it was back to Kawaramachi and the train back to Osaka. It’s another late start tomorrow. Off to Nara but trying to time the trip so that I’m still there after dark as February 3rd is a very special day in Nara… Setsubun Mantoro, where every one of the 3000 lanterns at the Shinto Kasuga Taisha Shrine will be lit for 1st of only 3 days in the year to celebrate the transition from winter to spring. More of that tomorrow…! Apologies for the late posting of this blog, didn’t have much Internet access today. Day 6 was one of firsts! After last year’s visit to Himeji and Mount Shosha, I said I’d like to return to visit Himeji Castle (world heritage site) and also explore some more of the town, so today set off quite early for the journey out past Kobe and parts of the inland sea. The trip was fairly straight forward: underground to Umeda then a train from Umeda straight to Himeji on the Hanshin line. The journey takes almost an hour and a half and includes stops at Kobe and some lovely views out over the Seto Inland Sea. Once at Himeji there was time for a coffee and some Japanese savoury pastries before the 10 minute walk to the castle. 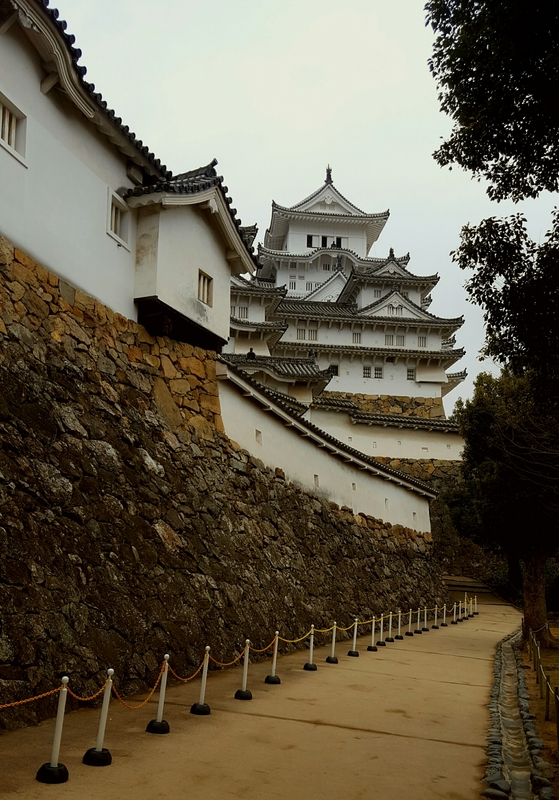 Himeji Castle is generally regarded as the finest example of early Japanese castle design and is one of the oldest castles in Japan. It is also the largest castle in Japan so took a while to look around! After a few hours wandering around the castle (and taking lots of pics!) It was back down to Himeji town for some siteseeing, shopping and a bite of lunch. After a while – now carrying home some newly purchased kimono – it was back on the train for the trip back to Umeda. 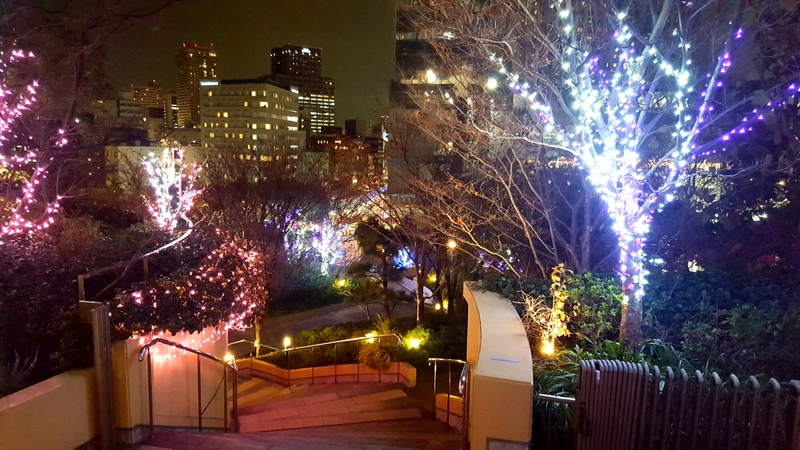 The evening was spent exploring the roof top gardens of Namba Parks in Osaka. I’ve stayed in Namba every time I’ve visited Osaka and I’ve been through the Namba Parks malls many many times but tonight was the first trip up to the roof top gardens. There’s a winter theme to the gardens just now and I really wish I’d visited on previous trips as it would have been great to photograph in different seasons. There was a food fayre going on 10 floors below and the smoke and smells of Japanese BBQs and hot plate cooking wafted upwards mixing with the freezing night air so that every now and then you’d walk through a smoky cloud of teppanyaki, grilled chicken, tempura or okonomiyaki. A great place to visit and one I’d definitely recommend to anyone coming to Osaka.